Given how acute the problem of junk in space has become, the ISS could soon be equipped with an ultra-modern laser gun, to protect it from space debris. But, according to scientists, this may prove inadequate. Without a comprehensive approach to the problem, this debris could form rings around the Earth, just like the ones around Saturn, in 200 years. In 2017, the International Space Station (ISS) will set up the Extreme Universe Space Observatory, primarily to monitor space debris. If the project is successful, space scientists will develop a laser gun, to fuse dangerous particles at a distance of around 100 kms, and direct them towards the Earth, where they will burn up in the atmosphere. Riken Computational Astrophysics Laboratory of Japan has designed this project. According to scientists, a laser is just one of the possible ways of clearing low-Earth orbit debris. Russia is thus now planning to develop a satellite - scavenger ‘Liquidator’ by 2025. In December this year Russia will launch the satellite ‘Lomonosov’, to observe space debris. 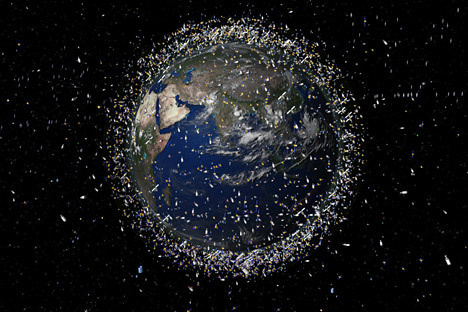 Space debris is flying around at a speed of about 8 kilometres per second. “The problem is very pressing. In recent years, small pieces of debris have often hit spacecraft, causing them serious damage,” Alexander Zheleznyakov, Academician at the Russian Academy of Cosmonautics by Tsiolkovsky told RIR. “A 2 centimetre (cms) piece of debris can completely destroy a spacecraft. Even if a grain hits a piloted spacecraft, it will cause depressurization and death of astronauts,” Zheleznyakov said. From where does orbital debris come? Scientists around the world are trying to resolve the problem of space debris. According to Ivan Moiseev, head of the Space Policy Institute, until recently, Russian and American space services were trying to track the movements of pieces of debris during launches of spacecraft or when correcting their orbits. “The laser is useful because it can heat up the debris. When it starts evaporating, jet thrust is created. The debris will fly towards the Earth's atmosphere and burn in it on re-entry,” Moiseev said. The problem of space debris became particularly acute after the collision of the satellites Cosmos-2251 and Iridium 33 in 2009. The accident literally “showered” the low-Earth orbit with debris at an altitude of 700-900 metres. Scientists have counted tens of thousands of large fragments the size of a few cms, and millions of smaller ones. Another case which seriously complicated the work of space services was an experiment by the Chinese military, which shot down their own weather satellite in 2007. “The fragments of the missile and the satellite will always keep revolving around the Earth,” Moiseev, the Space Policy Institute’s scientific director said. In order to prevent similar disasters in the future, it is necessary to introduce legal regulations for space. In addition, according to Moiseev, participant countries of the ISS project should agree on how to share the costs of a laser gun that is being developed by Japanese scientists. “Until it is decided, nothing important can be done,” he said. Mankind began to think about the problem of space debris in the early 1990s. Back then, scientists from the United States and the Soviet Union had prepared a number of major works with forecasts that are starting to come true. According to some experts, the situation is gradually getting out of control. “The amount of debris will become critical when it will start mass self-reproduction,” said Yuriy Zaitsev, head of the Institute of Space Research. “We are now at a level that can be called close to the critical point,” he said. According to Professor Andrey Nazarenko, author of the book “Space Debris Modelling,” there is now a dangerous process of debris fission when they collide at high speed. “Measures such as lasers are local. They can solve the problem of safety of one spacecraft or satellite,” Nazarenko said. “According to our estimates, in around 200-300 years, people will not be able to launch spacecraft, because space debris around the Earth will form rings similar to Saturn's rings. The Earth would be simply constrained by these small particles. It is possible that this will also lead to serious climatic changes,” a concerned Nazarenko said.